Ingredients : Chick Peas, Green Gram, Barley, Pearl Millet, Cowpea, Finger Millet, Soya Bean, Fenugreek, Amla Powder. Delight Medley Pro is a combination of grains that help regulate blood sugar levels, builds immunity, reduces cardio vascular problems, reduces cholesterol, removes toxins etc. Delight Medley Pro is especially rich in protein, an essential building block to cell growth and regeneration. Protein sources that are also plant-based actually help lose weight as you lower cholesterol. Delight Medley Pro is an assortment of cereals, legumes, pulses, spice and dehydrated fruit powder. Medley is an assortment. In Delight Medley PRO, we have used an assortment of cereals, legumes, pulses, spice and dehydrated fruit powder, probably to get the best of all varieties. "Good" carbs is used to describe foods that have more fibre and complex carbohydrates. Complex carbohydrates are carbohydrates that take longer to break down into glucose; such as vegetables, fruits, whole grains and beans. Fibre, a type of carbohydrate, removes waste and promotes bowel health by allowing waste to move more quickly through your gut. They are mostly found in grains, fruits and milk but are also found in nuts, seeds, beans and vegetables. Proteins from vegetable sources are thought to be better than those from animal sources. Protein builds new cells and fixes damaged ones in all parts of your body. Protein is made up of amino acids. Along with growth and repair, they preserve muscle mass, hormone production, enzyme production, properly functioning immune system and to provide energy if carbohydrates aren’t available. Protein is a macronutrient, which means the body takes its best energy stores (or nutrients in order to function) from protein. Protein is essential for daily movement, memory, thought, and physical exertion. Fats are broken down into their simplest form of fatty acids. Fat is used for cell membranes, energy, absorbing fat soluble vitamins, support for your internal organs and to provide taste and texture to food. Fenugreek, a spice, is rich in fibre, protein and minerals. It helps flush out toxins from the body. Gooseberry, a fruit, is a great source of vitamin C, removes toxins, and is a power house of anti-oxidants and increases protein metabolism. Thus the macro nutrients such as carbohydrates, proteins, fats and fibre from food grains namely cereals, legumes and pulses, and the goodness of Fenugreek and Gooseberry, is sure to help in the overall health of a person. The complex carbohydrates, essential amino acids, vitamins and minerals inherent in the ingredients used helps in combating various issues like cardio vascular health, weight management, and maintenance of blood sugar levels, detoxification, immune build up and constipation. The presence of methi helps in the production of insulin and slows down the absorption rate of sugar, making it diabetic friendly. The amla helps in protein metabolism and increases immunity. All the ingredients used in Delight Medley Pro, paves way for blood sugar regulation, benefitting the diabetic community. Step 1: Add 3 teaspoons of Delight Medley PRO with 200ml of water. Step 2: Mix throughly without any lumps until it gets dissolved. Step 3: Cook the mix for 3 minutes, until it gets thick. Step 4: Ammae Delight Medley PRO porridge is ready. 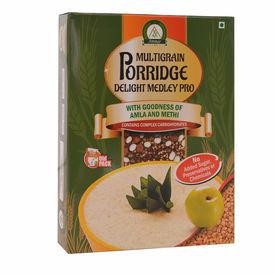 Delight Medley PRO Multi grain porridge with goodness of amla and methi - contains complex carbohydratesNo Added Sugar, preservatives, chemicals Ingredients : Chick Peas, Green Gram, Barley, Pearl Millet, Cowpea, Finger Millet, Soya Bean, Fenugreek, Amla Powder. Delight Medley Pro is a combination of grains that help regulate blood sugar levels, builds immunity, reduces cardio vascular problems, reduces cholesterol, removes toxins etc. Delight Medley Pro is especially rich in protein, an essential building block to cell growth and regeneration. Protein sources that are also plant-based actually help lose weight as you lower cholesterol. Delight Medley Pro is an assortment of cereals, legumes, pulses, spice and dehydrated fruit powder. Medley is an assortment. In Delight Medley PRO, we have used an assortment of cereals, legumes, pulses, spice and dehydrated fruit powder, probably to get the best of all varieties. "Good" carbs is used to describe foods that have more fibre and complex carbohydrates. Complex carbohydrates are carbohydrates that take longer to break down into glucose; such as vegetables, fruits, whole grains and beans. Fibre, a type of carbohydrate, removes waste and promotes bowel health by allowing waste to move more quickly through your gut. They are mostly found in grains, fruits and milk but are also found in nuts, seeds, beans and vegetables. Proteins from vegetable sources are thought to be better than those from animal sources. Protein builds new cells and fixes damaged ones in all parts of your body. Protein is made up of amino acids. Along with growth and repair, they preserve muscle mass, hormone production, enzyme production, properly functioning immune system and to provide energy if carbohydrates aren’t available. Protein is a macronutrient, which means the body takes its best energy stores (or nutrients in order to function) from protein. Protein is essential for daily movement, memory, thought, and physical exertion. Fats are broken down into their simplest form of fatty acids. Fat is used for cell membranes, energy, absorbing fat soluble vitamins, support for your internal organs and to provide taste and texture to food. Fenugreek, a spice, is rich in fibre, protein and minerals. It helps flush out toxins from the body. Gooseberry, a fruit, is a great source of vitamin C, removes toxins, and is a power house of anti-oxidants and increases protein metabolism. Thus the macro nutrients such as carbohydrates, proteins, fats and fibre from food grains namely cereals, legumes and pulses, and the goodness of Fenugreek and Gooseberry, is sure to help in the overall health of a person. The complex carbohydrates, essential amino acids, vitamins and minerals inherent in the ingredients used helps in combating various issues like cardio vascular health, weight management, and maintenance of blood sugar levels, detoxification, immune build up and constipation. The presence of methi helps in the production of insulin and slows down the absorption rate of sugar, making it diabetic friendly. The amla helps in protein metabolism and increases immunity. All the ingredients used in Delight Medley Pro, paves way for blood sugar regulation, benefitting the diabetic community. Recommended method of consumption, prepartion time - 5 min Step 1: Add 3 teaspoons of Delight Medley PRO with 200ml of water. Step 2: Mix throughly without any lumps until it gets dissolved. Step 3: Cook the mix for 3 minutes, until it gets thick. Step 4: Ammae Delight Medley PRO porridge is ready.